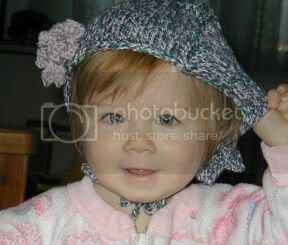 The real reason that knitters have babies is so that they can make them cute hats. 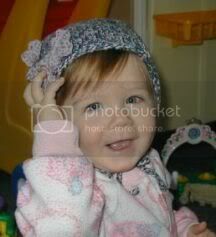 The first hat I knit, out of Noro Kochoron, was absolutely lovely--but also far too big. It will be a winter hat for next year or the year after. (An aside--I found the Kochoron in a bargain bin for $2--score! 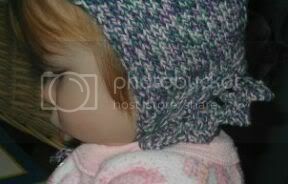 This version of the hat is knit out of Cascade Sierra, which is a cotton/wool blend. It should be a great weight for chilly spring days in New England. 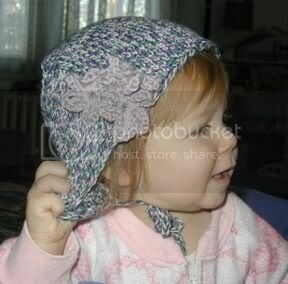 This hat is definitely a unisex pattern, but I decided to "girly" this one up a bit by adding some crocheted flowers on the top and a lace edging in the back. This picture shows a bit more of the side of the hat so that you can get a better idea of the general construction/shape. 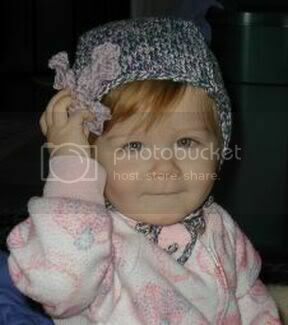 And if you just need one more cute picture, click here.